One capsule on an empty stomach, or with a very light meal, twice a day. Unbreakable will reshape your perception of what a joint care product can do, delivering results that are both a level beyond anything else available in the market and at a speed which will ensure that you are able to recover both faster and better. It will boost whole body healing capabilities to a level you need to experience to appreciate. Unbreakable can be used for four weeks at a time followed by a two week break. Anyone seeking the ultimate in accelerated regeneration. Unbreakable is based on an orally-active protein known as BPC-157. The letters "BPC" stand for "Body Protection Compound," which are an accurate description of what this protein does, for it has been shown to strengthen tendons and ligaments and greatly enhance their healing rate following injury. It has also demonstrated a clear ability to hasten the healing of muscle tears, broken bones, and other more severe injuries. And although it is a protein, it has demonstrated very high oral bioavailability -- no surprise, as, in humans, it is an endogenous gastric protein -- so oral administration is a straightforwardly viable tactic. Unbreakable delivers BPC-157 at a clinically-studied dose, so that you can enjoy healthier joints, ligaments, and tendons. Unbreakable doesn't stop there. In addition to BPC-157, it provides a hefty dose of a highly standardized andrographis paniculata extract, and an extremely high-grade cissus extract, for additional support. Both ingredients are tried and true, and favoured by millions of people looking for joint support and healing. 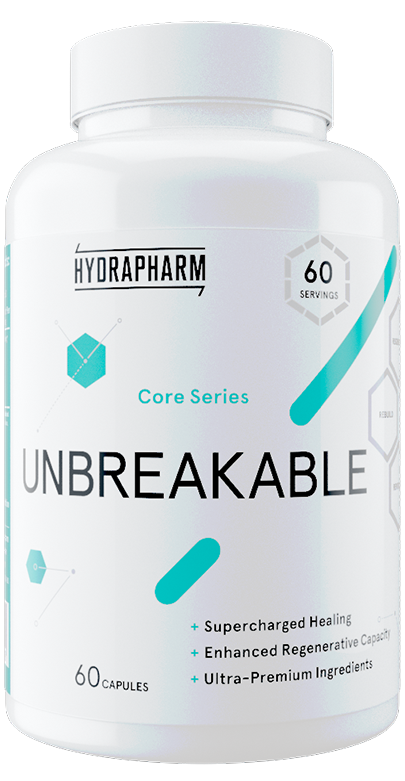 Unbreakable is another category-killer from Hydrapharm - for joint support, repair, and relief, nothing else comes close. Don't let those old injuries hold you back in the gym or on the field. Helped me a great deal with my shoulder. Now I´m back on track with both benchpress and overhead press! I feel my joints can take a lot more stress when I'm on this product. Also felt a very strong boost to my immune system. I went quad biking and thought I’d broken a bone but went to the hospital and they couldn’t see a thing but for three months post-accident I couldn’t train properly. Very annoying cos I knew going back to the doctors would get me nowhere. A friend suggested this and within a week, my wrist/hand felt much better and so super impressed by this. This helped me recover from a similar issue that I had just 1 year ago, taking me considerably less time to recover (at least 1 month less). Just to also clarify, I used this product together with Joint Force. Feel my joints can handle heavier weights and noticed my recovery time is definitely quicker. Great product especially when lifting heavy weights !! I think you need to have a good grasp of what your issue is, I have had injured knees and this didn't really assist in anyway to be honest. It improved just slightly but that could have been through natural recovery. The best joint supplement on the market.. can feel a difference within a few days. This is my go-to supplement. When using it I feel ten feet tall and bulletproof. Unbreakable - I would definitely recommend this! This definitely works. I've been suffering with knee pain for years, some days feeling like my legs are gona go from underneath me. It took a good week for me to realise it was working, still have the odd pain here and there but I do work a lot on my knees. I would definitely recommend this! I've been having problems with a minor hip injury that has been nagging me for the past few months. I've just finished the bottle and I am very impressed, improved mobility and joint has healed well. Don't expect instant relief, rather a slow repair process that has made me feel better than ever. This is amazing. I am 59 years old and my wife is 57 and we train intensely 7 days per week. Not an injury problem in sight, even though we are both ripped and dry our joints are fine. We train both heavy and with lots of reps. We feel we have even fewer issues since we have used this amazing product. I am 59 yrs old and my wife is 56 yrs old. We train intensely (No! really) 7 days a week and have done for over 40 years. No straps, wraps or belts - No injuries or aches and pains. I credit unbreakable for much of this as if anything I have less injury issues as I am getting older. Same for both of us. I can't say much more than that. I've done my ACL and my knees can feel shot at varying times of the year, and during a particularly bad time, I ordered this and it ironed out the problem in about three days. A wonderful supp. This is one of those supplements that I miss if I run out. This is one of those supplements that I miss if I run out. Working quietly behind the scenes to keep me (us) fit to train 7 days per week intensely at 58 years of age. My wife uses it too. When we run out it is conspicuous by its absence. Great product. This product is great. I had torn my ACL in my knee 10 years ago and dislocated my shoulder in high school. On this product no pain and I have full range of motion. For tendon long-term problems, this is working much better than any other supplement in the market. Surprisingly, it seems it helps mood swings too! I have trained with my wife for over 40 years and we train very intensely. Competed a few times. Still hit the gym 4am, 4+ times a week. We were discussing how dry we are and wondered why we weren't getting the sore joints that normally accompany dry bodies. And I have stopped having gut issues. Little things that are conspicuous by there absence. Couldn't work it out. Then we ran out of unbreakable the other day and the penny dropped. Our bodies have been ache free in my opinion because of the unbreakable, morning and night time. Wow! Subtle but very effective. I will be keeping it in my regime for sure. I am 59 and my wife is 56 so there is not much stiffer test for it than that. We train upper lower splits and that is a lot of strain on the body. Pain free from about the time unbreakable came into our lives. With my increase in strength usually comes more joint and bone pain. Well no more pain, and much more gain! Recommend! Bought this for my girl! She has an old injury in her knee, but this products really helps! A great supplement, it worked within days and really sped up my healing times with a sprained ankle. This is just amazing, eliminates muscle or niggly pains from training. Will stock up on this. After three weeks I have noticed that an old arthritic pain of the lumbosacral joint, and still training, is giving way despite my age: 59. It seems that it works without other anti-inflammatorys. That's why I'll continue taking another container after a two-week break. I was sceptical, but I tried just in case, and it has worked for me. I recommend it. Shoulder clicks and pains improved! I'm just after finishing my first bottle and I've just started the second. My shoulders and general joint health are much better recently - so much so a 3rd bottle is on the way. I had little pains in right knees, and left shoulder, knee pain is gone straight the first day I took it. My shoulder hurt still a bit, but I train 4 times per week and each day is less painful. So I can tell Unbreakable does a really good job these two last weeks of use ! I can feel all my joint are more lubricated. Been dealing with some lingering shoulder impingement, and even if the rehab work i did plus mk677, kept it at bay, it just never went away. After 2 weeks with Unbreakable 2 caps per day, it cleared up, like completely gone. You have to try this. Having used injectable BPC-157 but not liking injections I was sceptical but I have to say I think this is actually better than that and the research seems to back up hydrapharm that this is deliverable orally equally as well as through other ways. Did experience some pain reduction and better stability in some of my problem areas. This stuff is amazing. I was buying it for some sore elbows and knees but while that issue is revolved now, it's also great for overall recovery and even my mood! 1 week in and I can already tell it's working. I have a recurring ligament/joint issue in my right arm that stops me lifting heavy on back and bicep days. The pain has drastically subsided faster than when I try other glucosamine/chondroitin or cissus based products.